Jeannine Parise of VMS Accelerators will educate staffing suppliers on how to increase recruiting efficiencies on VMS accounts while lowering servicing costs. Servicing VMS accounts in 2011-2012 is all about the money! That's right! There's really only one reason to service VMS accounts-the money. Sure, you want to have a marquee account. Sure, you want to be able to say you work with this Fortune 500® company and that Fortune 100™ company. But what it really boils down to is this: "Are you making money-and how can you make more?" Jim Coughlin, Creative Director, VMSA and MAP program designer and trainer. This FREE 30-minute webcast will describe in detail the syllabus, curriculum and schedule of VMSA's MAP (Mastering the Art of Production) program. Find out how the program is laid out and discover all the content that will be covered. This program is for recruiters, account managers, recruiting managers and staffing executives who are involved in servicing MSP/VMS accounts. This webcast will be available for playback. This is a "must attend" for all Speakers, Panelists, Moderators and Facilitators of VMSA Live. Get the most out of your speaking opportunity. Event timeline for speakers and presenters including "best practices tips" will be covered - in order to ENGAGE your audience to the fullest and leave a lasting impression. This sponsorcast will focus on how to maximize your investment in VMSA Live as a SPONSOR. In this webcast you will learn all about how to sponsor the next VMSA Live Conference in Las Vegas on May 5-8, 2015. We are leveling the playing field and letting the market decide what each opportunity is worth. You pick and configure the spots that make sense for your business. Think sponsorship is only for the larger firms? Think again! Join us to learn how to gain visibility and reach your target audience at a price point that makes sense for every size firm on any budget. Here's your chance to learn more about our MSP Delivery Training on November 12-13, 2013 in Jersey City, NJ. If you are servicing large staffing accounts through an MSP and/or VMS, you cannot miss this one-of-a-kind training intensive sneak peek. Day 1 (Nov 12) is intended for Recruiters and Recruiting Managers and Day 2 (Nov 13) is for Account Managers and Recruiting Managers. Come prepared with questions and get ready to register. For years you have successfully worked around those dreaded VMS / MSP (Vendor Management Systems / Managed Service Provider) programs. Compressed margins and limited hiring manager contact was not part of your vocabulary. Now... your customers are saving millions by implementing a centralized VMS program. It's time for you to embrace this reality and get in the game. But where do you start? Jeannine Parise of VMS Accelerators will educate search and staffing firms on how to make money working through VMS accounts. 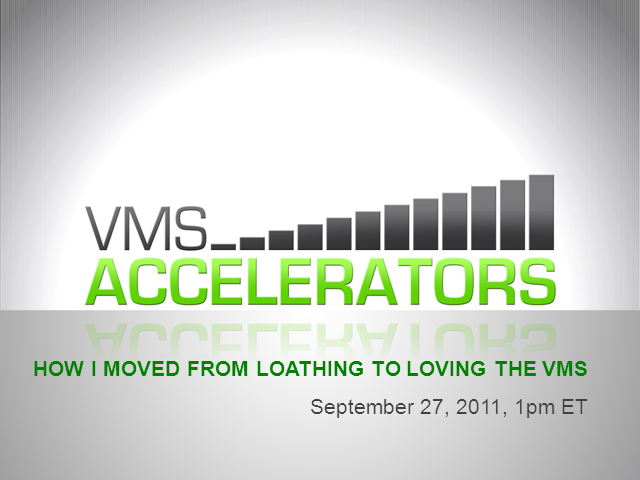 VMS Accelerators conducts performance enhancement seminars to thousands of staffing suppliers globally. These high-impact, content-driven webcasts improve efficiency, speed, communication, processes and deepen the professional relationship between the MSPs and their respective recruiting partners.